The entire country pauses on Dec. 25, as Christians commemorate the birth of Jesus of Nazareth, known to Christians as God’s Christ and Savior, and known to many as The Prince of Peace. The impact of this one special life has reverberated through the centuries. Kingdoms and governments rise and fall; the celebrities of one generation are largely forgotten by the next; powerful institutions and organizations—from central banks to giant business enterprises to mighty armies—come and go, but the influence of Jesus of Nazareth endures. From the very beginning, Jesus’ mission was misunderstood. Many of his own people had expected God to send them a mighty man of war, not a healer and teacher. Today also, Christians often misunderstand their Savior, as when they invoke the New Testament as justification for government to forcibly redistribute wealth in the name of charity. The social gospel, social justice, and liberation theology strains of Christianity have overlooked one fundamental principle of Jesus’ life—one that should be especially obvious at this time of year when we think of Jesus as a tiny infant: He never used force to compel others to do good. In Matthew 19, Jesus offered a rich young man a contract—his wealth to be given to the poor (demonstrating that he would not make an idol of his money and be willing to follow Christ fully) in exchange for eternal life—and he accepted the man’s decision to decline the offer. In Luke 12, he refused to get involved in a “redistribute the wealth dispute,” tacitly accepting the sanctity of property rights. In the parable of the Good Samaritan (Luke 10), Jesus illustrated genuine Christian charity. The Samaritan freely gave his own money and time to help the person in need. He most assuredly did not seize money from others to pay for the wounded man. Jesus shunned the use of force. He rejected the liberal temptation of using other people’s money to accomplish ostensibly charitable goals (what William Graham Sumner referred to as A and B deciding what C should do for D). Just as the physician’s first principle is “do no harm,” so Jesus did harm to nobody. He did not believe in a zero-sum economy in which one person would benefit at the expense of another, but believed in freedom, voluntary contract, and mutual benefits. His life was the highest example of the non-aggression principle in practice. He never taught that it was legitimate to help one person by trespassing on the rights of another. He never taught that the key to heaven lay in compelling other people do good things. Instead, he healed, comforted, taught, and saved human beings, rescuing them from their sins, errors, diseases, and fallibility with a love so far above the normal human sense of love that we still are far from grasping its full import. 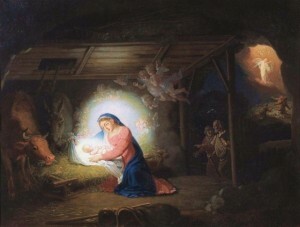 What we can grasp is the innocence and gentleness of the baby Jesus. Think of how blessed the world would be if that spirit governed mankind. At Christmastime 2013, it’s worth pondering what Jesus would ask of us today. I imagine it would be profoundly simple and sublimely wise—something along the lines of: Whatever you do, don’t hurt anybody and, if you can find it in your heart, be willing to help somebody.